In the north of Lausanne, about 500 meters above the surface of the Lake Geneva (Lac Leman) the great green wood extends – Bois du Jorat. I often visit it to ride a bike or run. Each year, me and my family take part in the big sport event: Journée Lausannoise du Vélo. The best known and most frequently chosen starting point for all kinds of excursions is Mauvernay sports center in Chalet-à-Gobet. 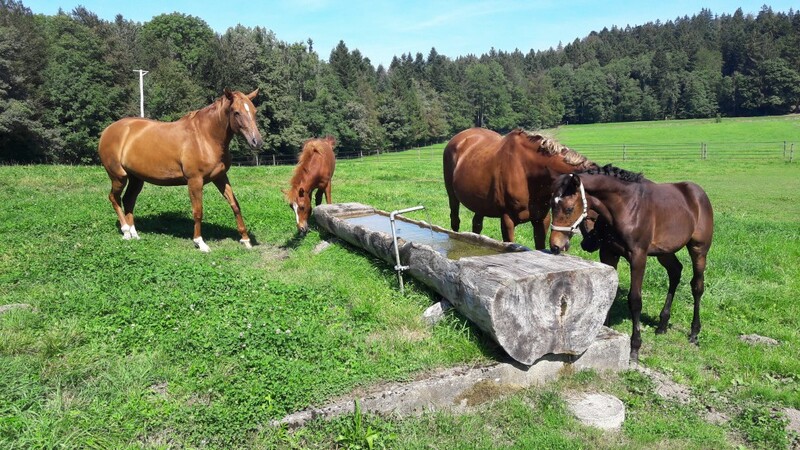 There are the starting points of health paths (Zurich Parcours Vita and Helsana), horse riding tracks and mountain bike routes. 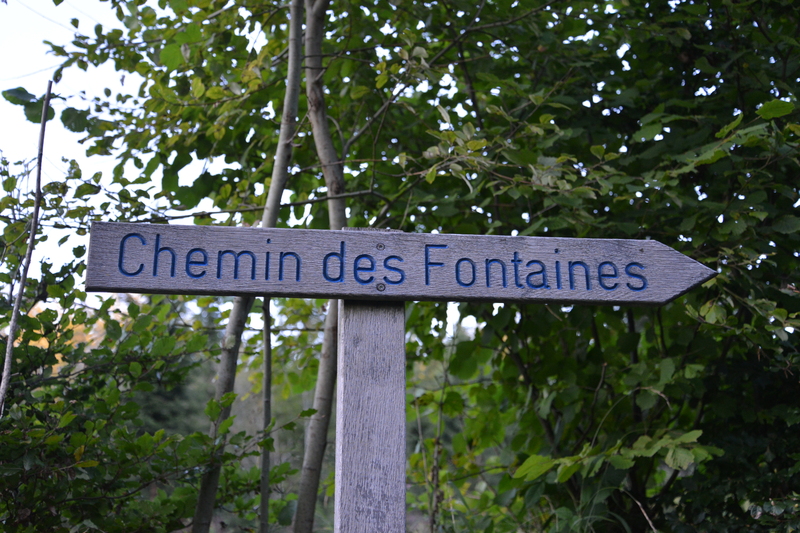 I went there also on that day, when I decided to hit the route aptly named Le Chemin des Fontiers des Bois du Jorat. The fountain road was created in 2003 on the occasion of International Day of Forests and World Water Day, which we celebrate on the 21st and the 22nd of March with the UN initiative. 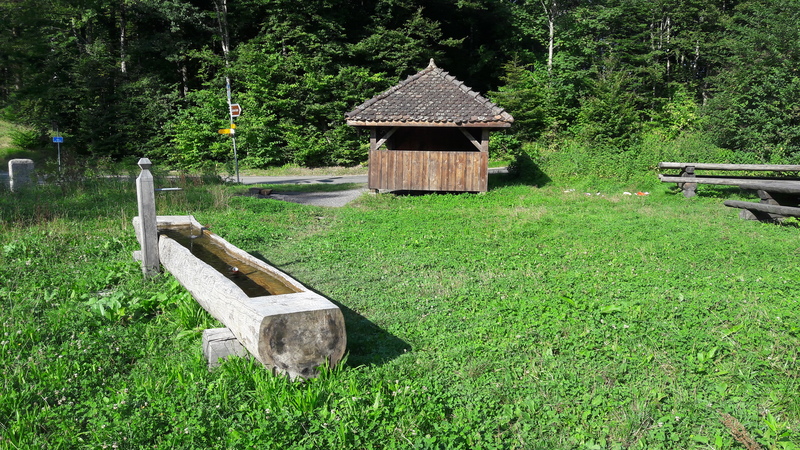 Already centuries ago, the most abundant sources in the forests in the north of Lausanne were captured into a network supplying drinking water to the city and surrounding communities. Sources of minor importance were used to supply fountains at the edge of forest roads, primarily used by loggers. Today, all visitors to this charming place can enjoy it. 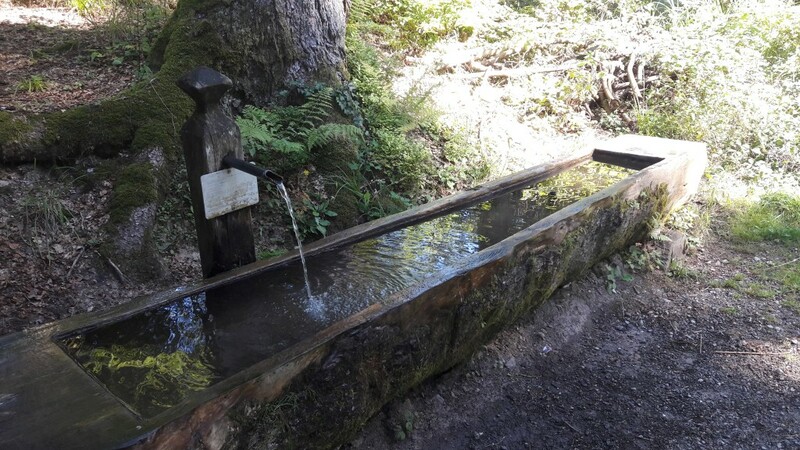 The water service (Service de l’eau) and the forest service (Service des Forêts domaines et vignobles) prepared a useful map of the route with locations of each fountain. Roadside signposts with the inscription Chemin des Fontaines and information boards are also helpful. The basic route measures 12 kilometers. Those who want to see 2 additional fountains must add another 7 kilometers. I choose the opposite direction than the flyer suggests, but clockwise. From the building of the sports center I turn left and immediately after the information boards with maps I turn left again and start running up the asphalt path. 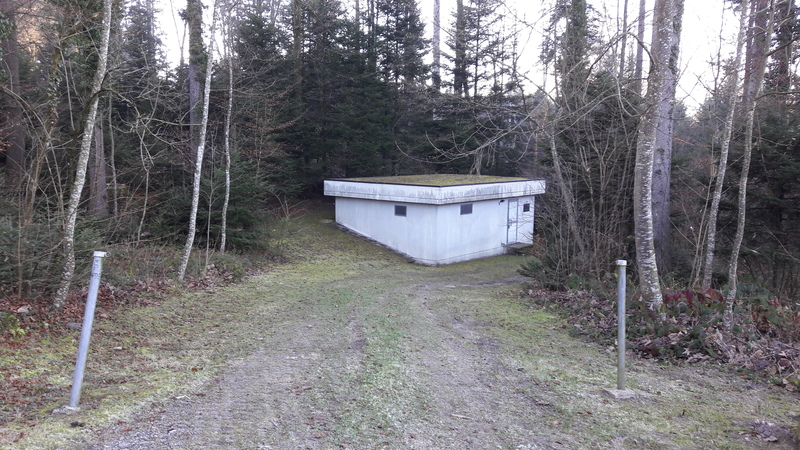 I run alongside the large buildings belonging to the forest service and continue down the Route des Corbessiers untill Route du Golf. On the other side of the street, continue down the forest path in western direction to the Military Fountain  (Fontaine des Militaires), about 2 kilometers from the start. 20% of the water that falls to the ground in the form of rain or snow is filtered through the molasse subsoil*, which occurs in these areas, and then enters the groundwater. Before the water reaches the surface again and comes out as a source, it is further filtered and mineralized by the rocks through which it flows (here most often limestone rocks). *Molasse (Latin mollis ‘soft’) – sedimentary rocks whose accumulation occurred in the vicinity of the mountains, during their uplift or soon after the rise; Their main ingredient is rock crumbs from the destruction of the mountains. 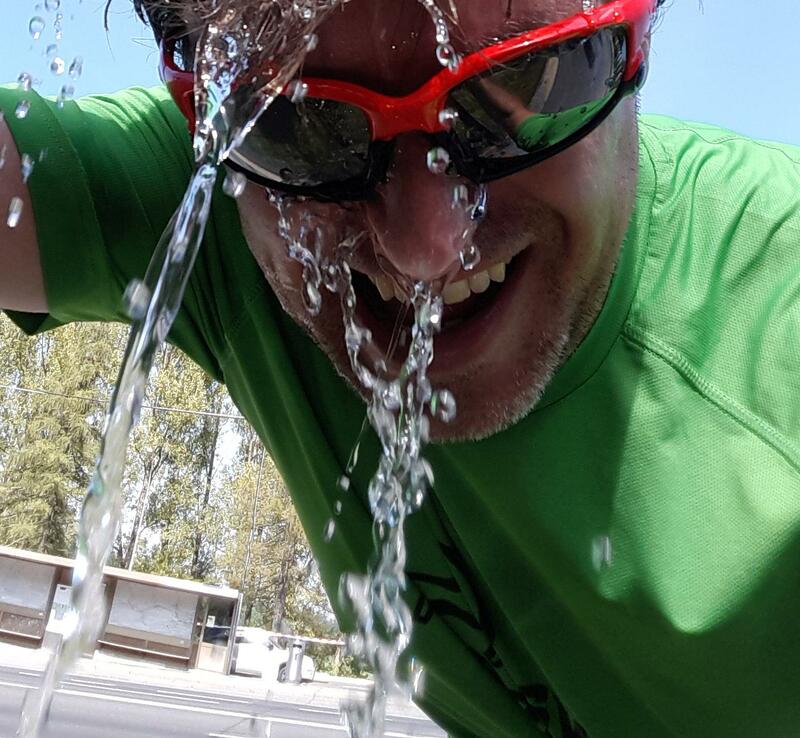 For safety and order I must mention that the water in the fountains on the route may be drinking (eau potable) or uncontrolled (eau non contrôlée). Uncontrolled water does not mean that it is undrinkable. This only means that the water supply service is unable to provide continuous quality control of the water. Depending on external conditions, changes in its appearance, odor, taste, microbiology and chemical composition can occur (for example, after heavy rainfall). The next 600 meters, I run the gravel forest path of Chemin des Liaises towards the west. When I reach the asphalt road Route des Planches, on the opposite side I see the next fountain – Fountain of the Mill Stones  (Fontaine des Meules). 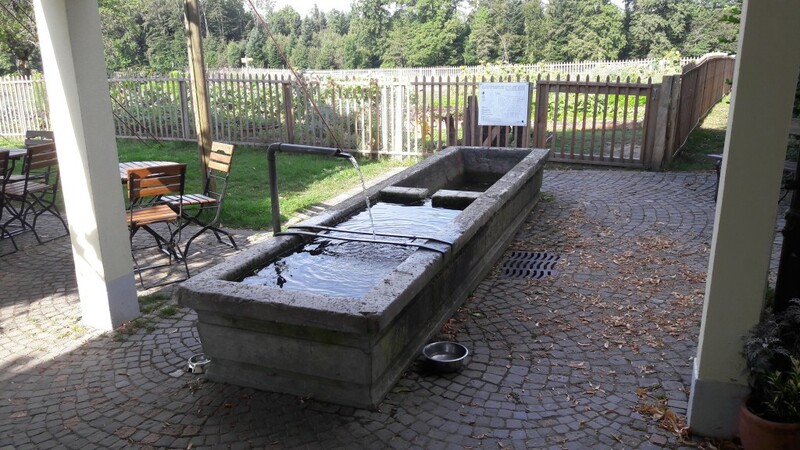 As you have already noticed, the names of some fountains are bizarre, and their etymology can reach the dark of “Middle Ages” (although in fact the Middle Ages were not at all dark). In some cases the origin of names can not be determined… Either way, the creators of the Fountain Way have tried their best and they have put information on every fountain about it. I will not give that information, but I encourage to explore the route and to know the history of the fountains, sources of water and its chemical composition. From Fontaine des Meules I head north, slightly up the hill through the forest and when I reach the asphalt road, turn right. About 1 kilometer from the previous fountain I get to the Chalet des Enfants, a charming restaurant serving Swiss cuisine and in particular the regional one. This time I only recall the previous visits to this place, I drink from the Fontaine du Chalet des Enfants  which is located in the yard and I continue east on the asphalt road. 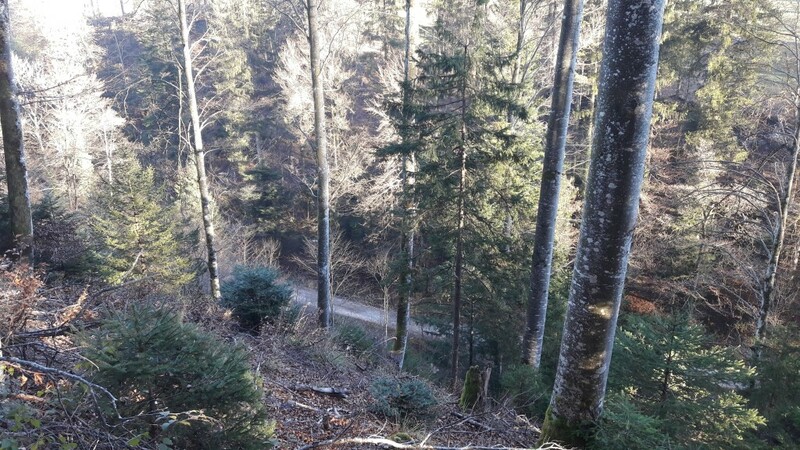 Just before the junction with the main road, I turn right between the trees where the walking trail goes (yellow signpost), I cross again the Route des Planches and follow the forest path untill the Fontaine des Gollies **. ** Gollies can mean: deep depression full of water, hollow filled with water, pool, pond. 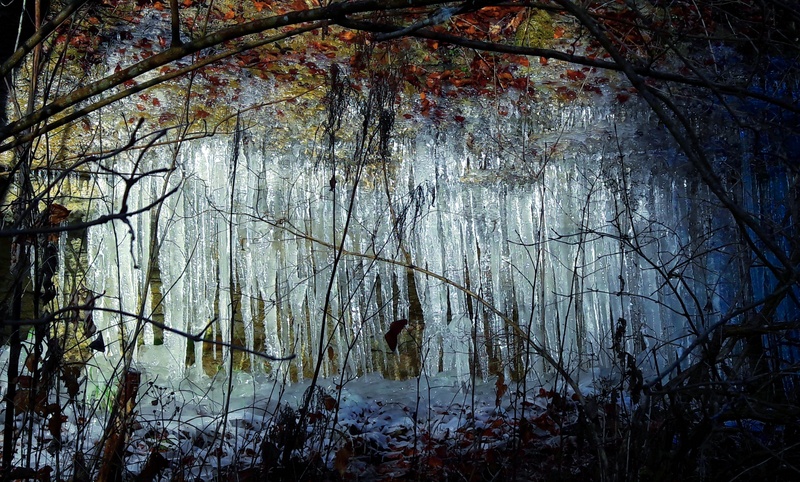 In the dialect of Suisse romande it means “hole in the stream”, and in medieval Latin “hole” or “pond”. The proverb says “Ça pleut toujours dans les grandes gollies“, what is translated as the rain always falls into the large pool, which means that money always goes to money. I drink a few sips, I take a few pictures and then I make a few steps back to the Route du Golf. I cross it and by the path between the meadow and the forest I run north-northeast, all the time keeping on to the marks Chemin des fontaines. 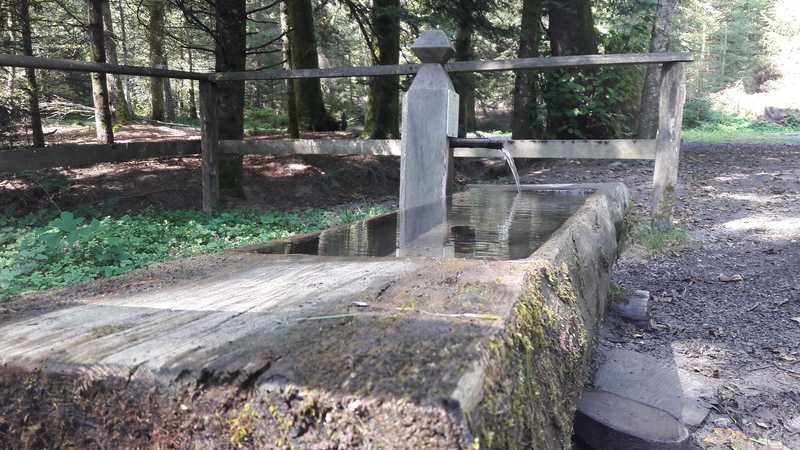 After 1.5 km I cross the bridge over the largest stream passing through The Jorat Forest and stop for a moment at the Fontaine des Côtes . 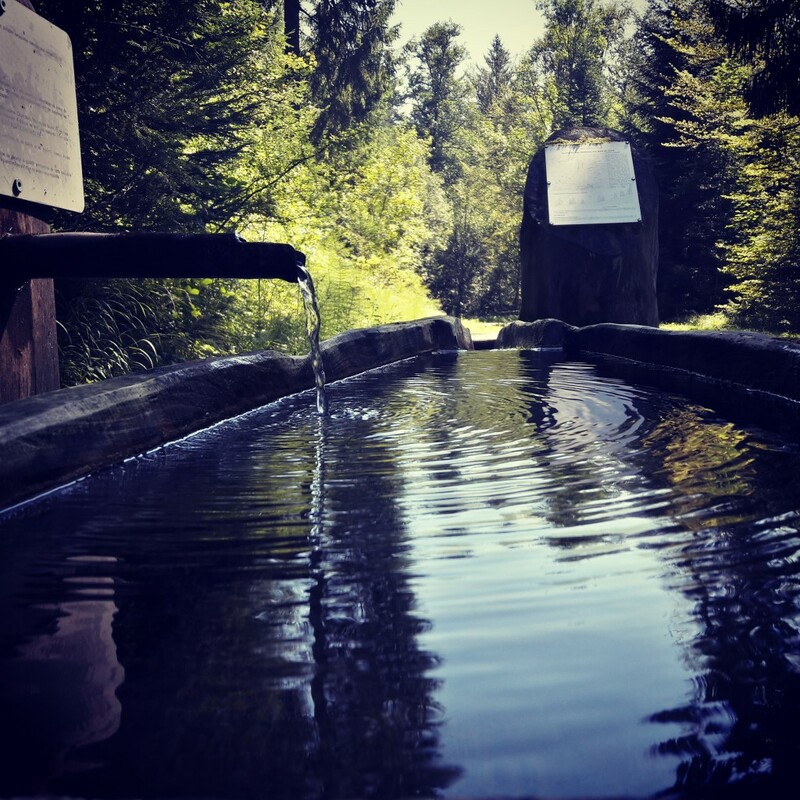 The name of this fountain comes from the picturesque and winding banks of Le Talent River. 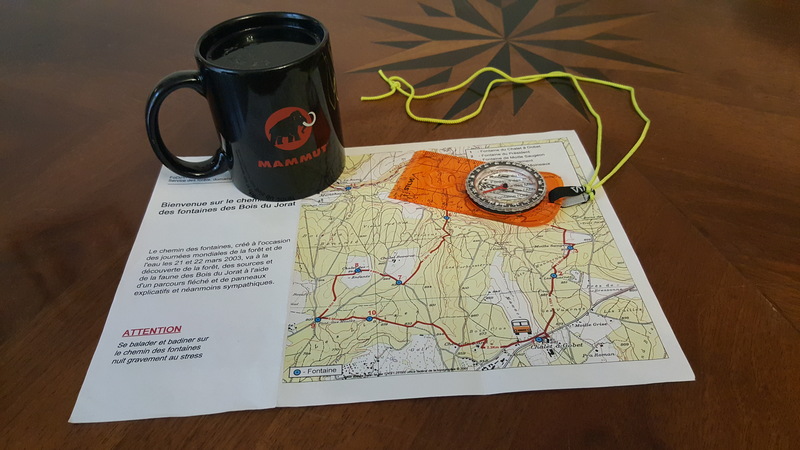 The official map mentioned above is accurate enough that you do not have to keep proposed route, but you can search for your own paths, shortcuts or… extensions. The map is like a pirate code, rather a collection of guidlines, not real rules. Code is more what you’d call “guidelines” than actual rules. In order to see two more (extra fountains), I would have to run back and forth the same way as the authors suggest, which always arouses my deepest aversion. So I do not run further to the north, as the map and signposts suggest, but I go back a few dozen meters across the bridge and turn into the first path going to the right (north-west). A gravel’s road runs along a steep slope above the riverbed of Le Talent and is parallel to the official route running on the other bank, by which I will return in a while, in a moment… The path along the river turns southwest and after a while to the west. I pass a waterworks buildingon located on the right side of the path. When I reach the asphalt of Les Saugealles road, I make 3 steps on the right side and run again into the narrow path leading right down between the trees. I went back to the asphalt road, which in the meantime changed the name to Route de l’Abbaye and turn right to… the abbey. Montheron Abbey founded in 1142 years by the Cistercian no longer plays its former role. From the times of glory remained only a small church and… a large restaurant (sign of our times). Fontaine de l’Abbaye de Montheron  and the supplying source of Holy Hipolit are on the opposite side of the road, at the beginning of the return journey along the riverbed of Le Talent. Before I can move in that direction, I have to “pass” another fountain, to which leads unfortunately only an asphalt road. I continue down the Route de l’Abbaye towards the west until the Route de Montheron and I turn left. 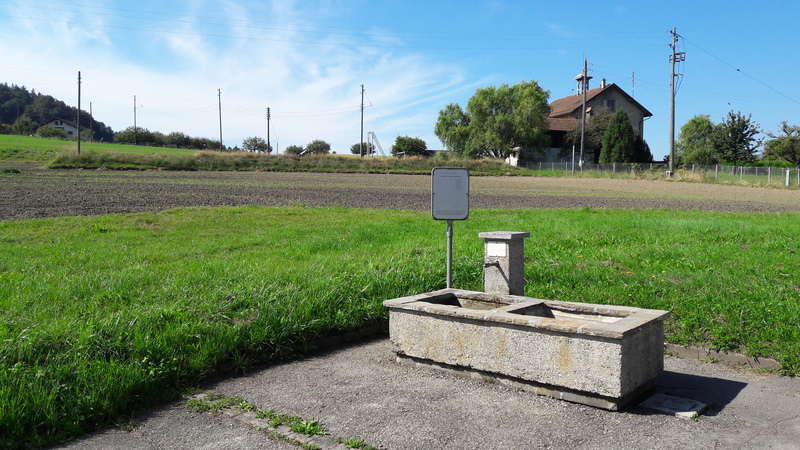 About 100 meters on the left side of the road there is an asphalt square with a small building behind which the Fontaine de l’Orée des Bois  is hidden; what means “fountain at the edge of the forest”. Today, the edge of the forest is far away from the fountain, which only confirms the negative impact of a man on nature. Although, it has to be acknowledged that the Swiss protection of forests has finally entered into the constitution, which is an idea worthy of imitation. I go back to the abbey following my own tracks and according to the plan I run up the river Le Talent, which cuts into the picturesque steep walls of the ravine. In the winter, on the sandstone rocks, fantastic ice waterfalls are created, but the valley is beautiful and well worth a visit whole the year. About 2.5 kilometers from the abbey I reach the same path where Fontaine des Côtes  is located and which I left about an hour ago to diversify my sightseeing tour. I’m not coming back to this fountain but I turn left sharply at 180 degrees and run a gravel road uphill to the north. 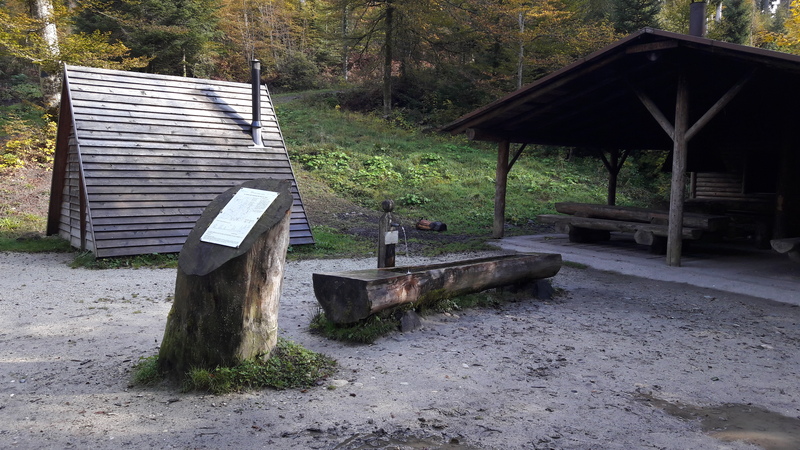 After 600 meters the road turns again to the south (I do not turn to Froideville) and after another 550 meters I stop at a wooden hut and Fontaine des Trois Moineaux  hidden behind it. In this case, the etymology of the name is very simple – someone,… once,… saw three sparrows bathing in that fountain and because sparrows in the forest are the rarity, so that already remained. Afters next 1.2 km I reach Fontaine du Paiement , at which still in the 70′s the forest inspector was paying (as the name implies) salaries for a dozen woodcutters working in the Jorat forest. I drink the water waiting for Godot, sorry… for the forest inspector, but a duffer did not show up and paid nothing, so I felt offended and I ran further. I crossed again Le Talent, much narrower in this place and after several dozen of meters I turned sharply to the left in east direction. When an extensive clearing opened in front of me, I turned right parallel to the forest edge and roughly halfway of the meadow, I followed the “fountain trails” sign and turned to the left. On the asphalt road, I turned right to the already visible building where horses often graze. 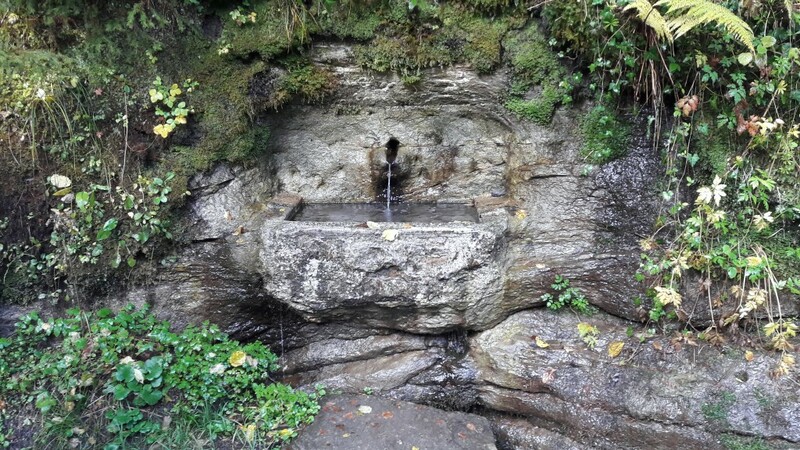 This is Fontaine de Moille Saugeon  distants from its predecessor by 1.2 km. The name of the fountain suggests it was once “a humid place where willows grow”. Now there are no willows, and the place is not humid at all. ***Moille – humid place, peat bog, swampy place, often in the hollow area; from Latin ‘mollis’ – soft, delicate. ****Saugeon – willow; from the Latin ‘salix’ and the French ‘saule’, a tree that usually grows in meadows and along streams. And if they would even go, where would they go? Where would they go, let’s say, willows? And march to the sea – is too far. So further, towards the sea… Mediterranean Sea, which means due south, slightly up the hill, again to the forest. 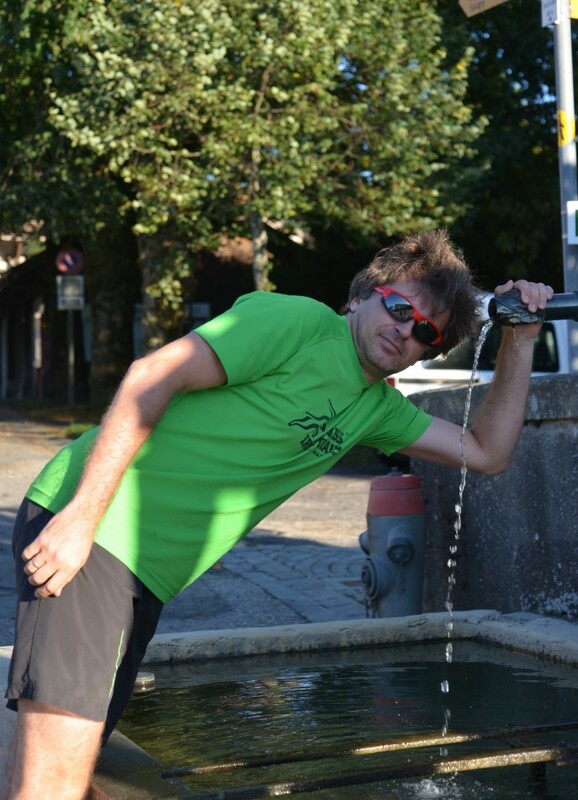 After several hundred meters I turn left from asphalt to gravel road and reach the Fountain of the President  (Fontaine du President). 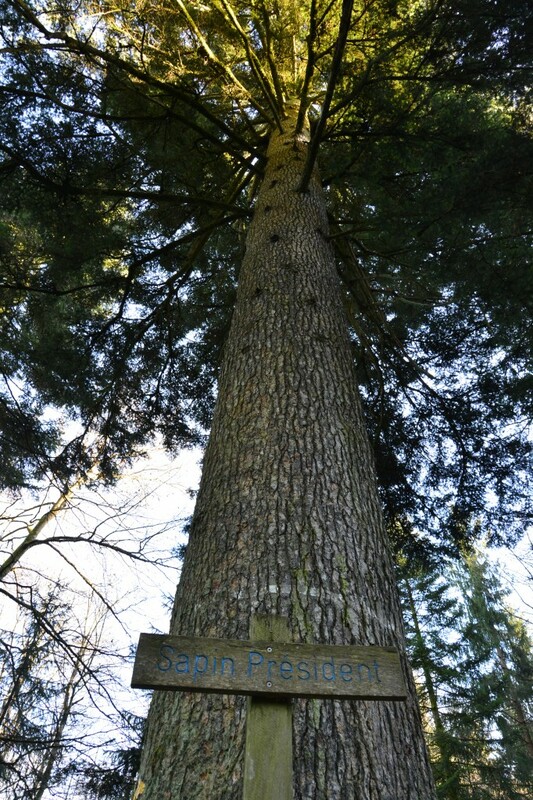 It is neither the “leader of the free world” nor the leader of the nation, who “is so put to patience and long-worn collar that it is ready to bite – the hand that try to bares it.” The fountain is simply next to the largest and highest silver fir (white fir) in the Jorat forest, called “President”. The age of the tree is estimated for 300 years and its height is over 50 meters, before it was “beheaded” for safety reasons. It should not be called President now but Major, like Major Davel, who was also beheaded by Berneseans, who occupied the Canton of Vaud in XVIII century. 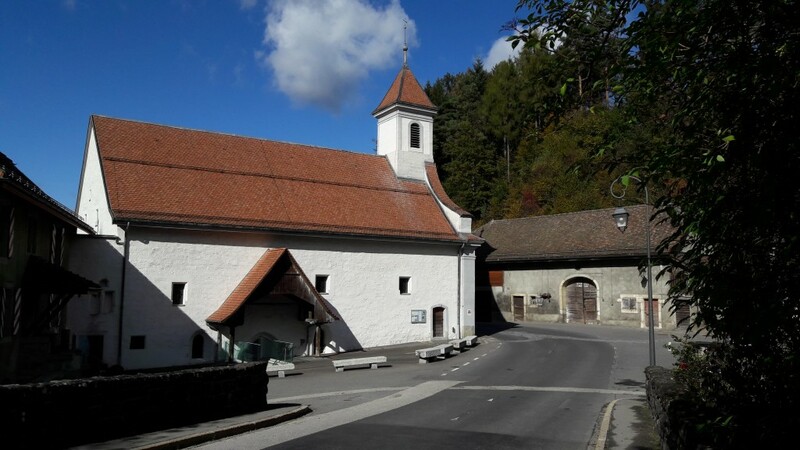 I mentioned this important event for Switzerland in the article From Ouchy to Saint-Sulpice. Another 1.1 km and I am coming back to Chalet-a-Gobet. 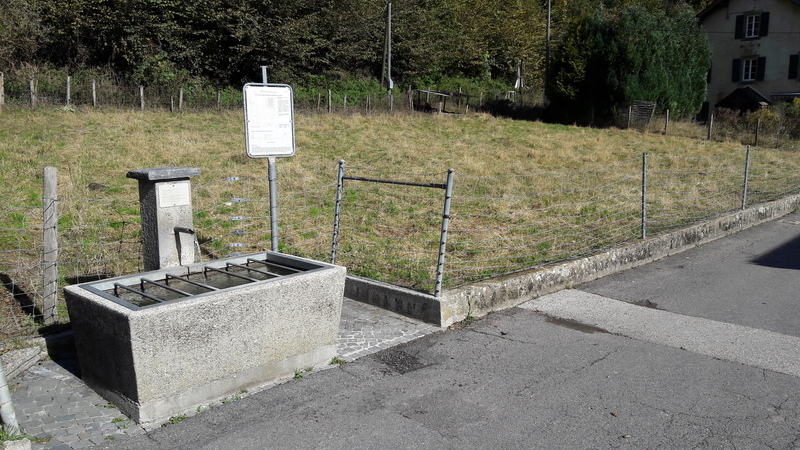 But before I close the loop of my route, I also visit the Fontaine du Chalet-a-Gobet , whose granite reservoir is standing next to the tavern serving local cuisine.